Annie Tuttle, the Managing Editor of Backwoods Home Magazine, posted on Facebook that a deer had died on her front lawn, in Corvallis, Oregon. 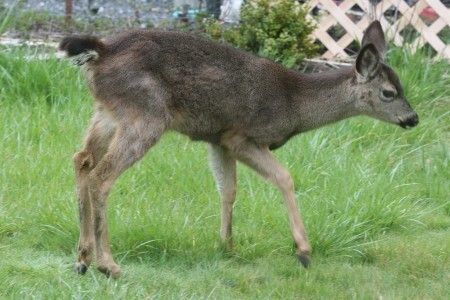 She called the Corvallis Animal Control and a wildlife rehab center and was told if the deer died on the sidewalk, they’d come and take it away; if it died on her lawn, it was her problem and she had to get rid of it. 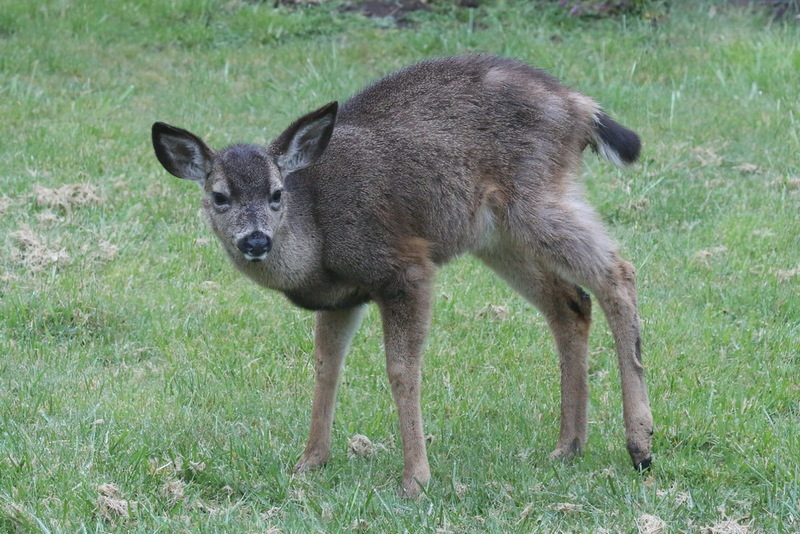 It occurred to me that had she shot a healthy deer dead on the sidewalk or killed one in her yard, she’d have gotten in trouble because it’s the state’s deer. But, as long as it died of natural causes on her lawn it was her deer. It’s bureaucratic thinking at its best—or worst. Anyway, I had a similar problem, here in Gold Beach, Oregon. 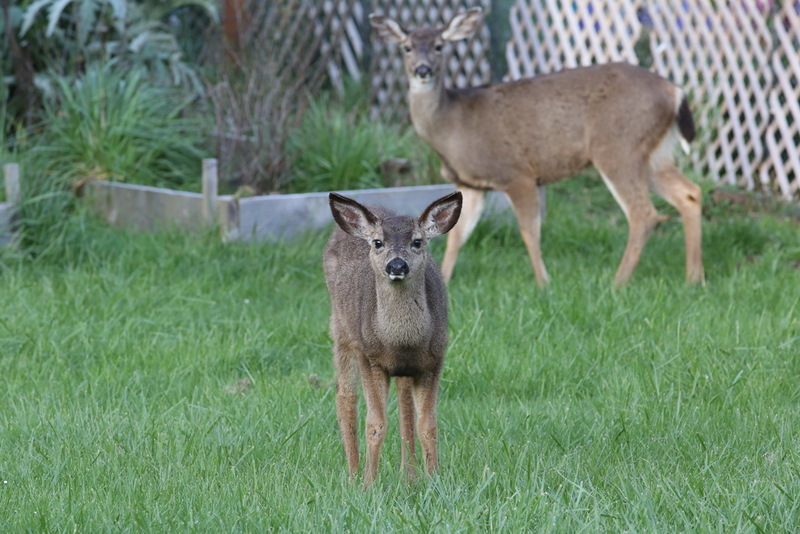 I had a doe and her year-old-fawn taking refuge in my yard. 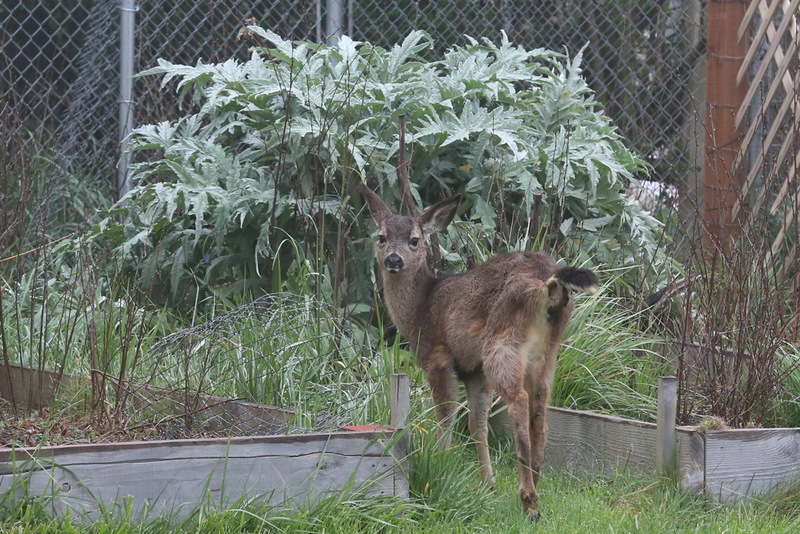 The fawn had an awful limp, as if its leg or hip had been broken. Hit by a car? Almost snagged by a mountain lion? Hurt while jumping a fence? I don’t know. But it was obviously close to incapacitated. My first thought was to call Animal Control or Fish and Game. That thought was immediately followed by the realization that they were most apt to come out and “put it down.” So, there were two possibilities: They could come out and kill it, or I could let it come into my yard where it would either die a natural, though uncomfortable, death, or it might recover and be a member of the herd of “town deer” that live here in Gold Beach. 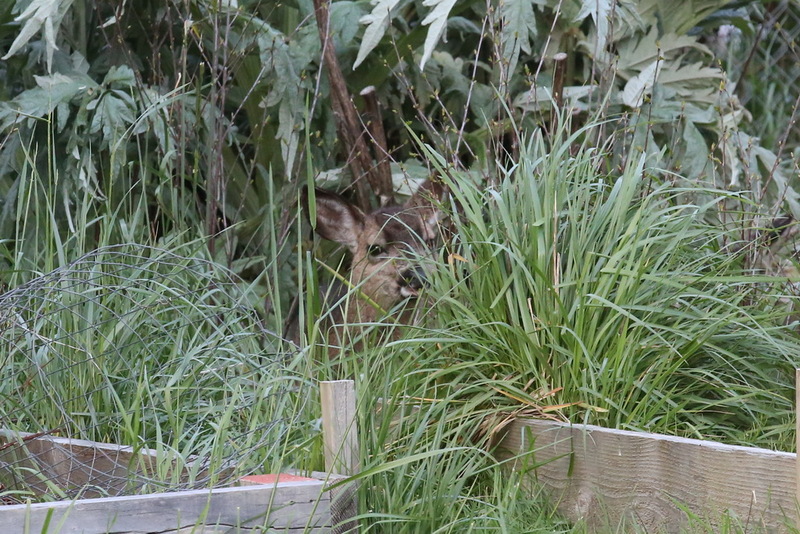 I decided on the latter and “let nature takes its course.” I left the gate to my backyard open so the fawn and its Mom could seek refuge there and they have been there most days and probably four or more nights a week. 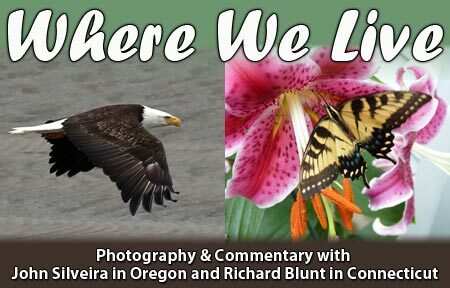 The weeks rolled by and. sometimes, the mom and baby disappeared for days at a time and I’d figure the baby had succumbed or they’d just moved on, then they’d reappear. Over the months, I’ve watched the fawn as it’s gone from barely able to limp to where it can, now, walk with a slight limp and even run. It’s difficult to show a limp with still photos. This is the best I can do. At first, this is the position the baby usually assumed. 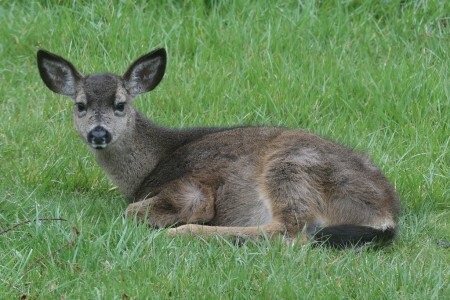 It just like to lie in the grass unless it absolutely had to move about. 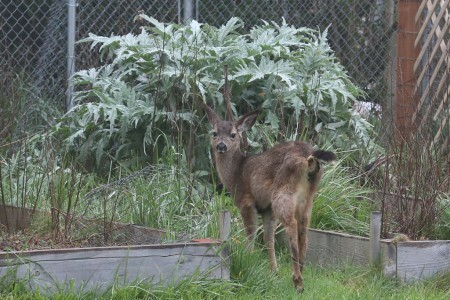 The fawn often liked to go back to the raised beds and lie under the artichoke plants. No longer afraid of me, the fawn was often curious about me. That’s Mom in the background. 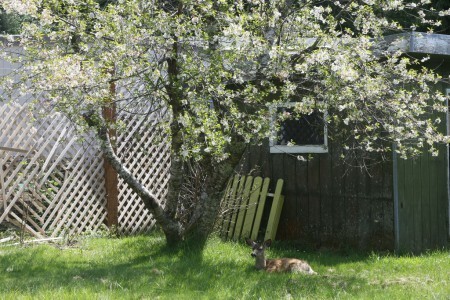 I’m only including this photo, of the fawn lying under my cherry tree, while the tree was in blossoms because I like it. This entry was posted on Monday, July 8th, 2013 at 9:39 am	and is filed under Town Deer. You can follow any responses to this entry through the RSS 2.0 feed. Both comments and pings are currently closed.